Went on this year's first local Wednesday ride and at about 40 miles in my bike went into "limp mode" and the FI light came on. As you may know, that is when it will run fine if you only tenderly open the throttle. Puled over shut it off poked, cursed, got back on. No light and it would accelerate as normal for about 2 miles. Then the light and limp. Made it home okay (Limping still allows you about 70mph if you nurse it.) The next day was the same 2 mile limit before the light comes on. In dealer mode it shows two codes; c28 & c65. Engine temp normal. Voltage normal. I've read through the forum and don't see a lot about it. I did find one thread where GreyWolf asked the victim if his bike would start without pulling the clutch lever in. (huh?) He answered yes, replaced the clutch-lever switch and the problem went away. Man GreyWolf was good. I never doubted him before and I have always robotically pulled the clutch to start. So I tried it and my bike would start without pulling the clutch. So that will likely fix the c65 code. But I can not believe that will cure the c28 which seems to be that the secondary butterflies are not opening. AS for recent maintenance: I did, a few days before, replace both sprockets and chain. Cleaned the clutch push rod. Installed a new rear tire. I had put maybe 20 miles on the bike after that and before the failure. .SENSOR ASSY #13580-27G21 $89 looks different in design. Just so we all know, what year, mileage, ECU swapped? How's your battery? The position feedback for the secondary throttle valves passes through the connector on the top. I would check for an abraded short. I think this is the connector that was rubbing on the bottom of the tank that there has been so much discussion about. I'd have to check my bike to confirm. 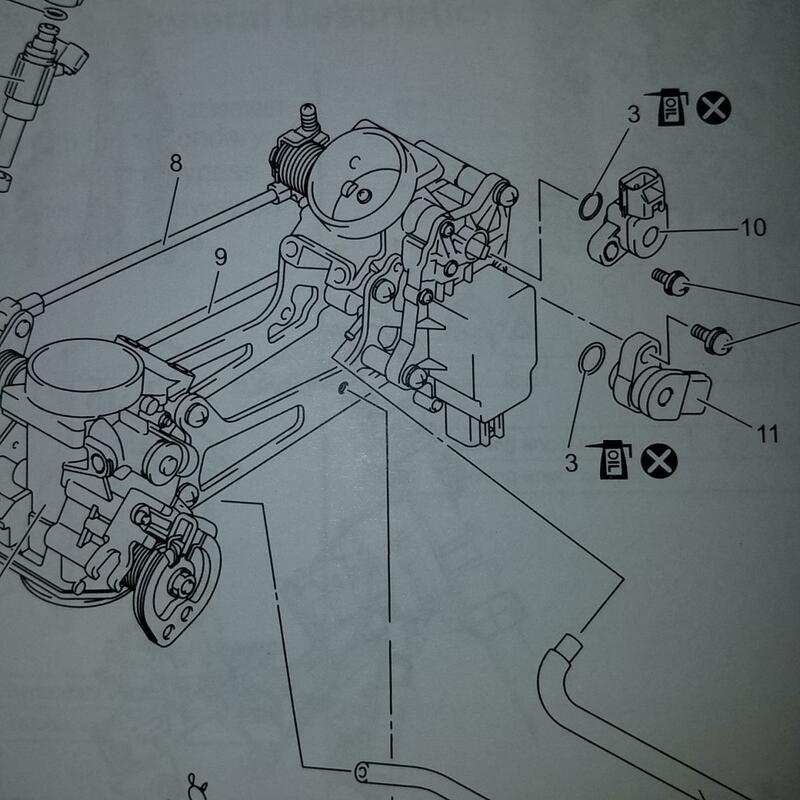 There is the throttle position sensor (#11) and there is the secondary throttle position sensor (#10) . The latter is the one that tells the ECM what position the secondary throttle butterflies are in. The latter is the higher of the two and the feedback circuit exits the sensor body through the connector on the top. Both of these sensors are on the left side rear corner of the rear throttle body. You'll have to lift the tank to see them. There has been much discussion about the wires rubbing the bottom of the tank. 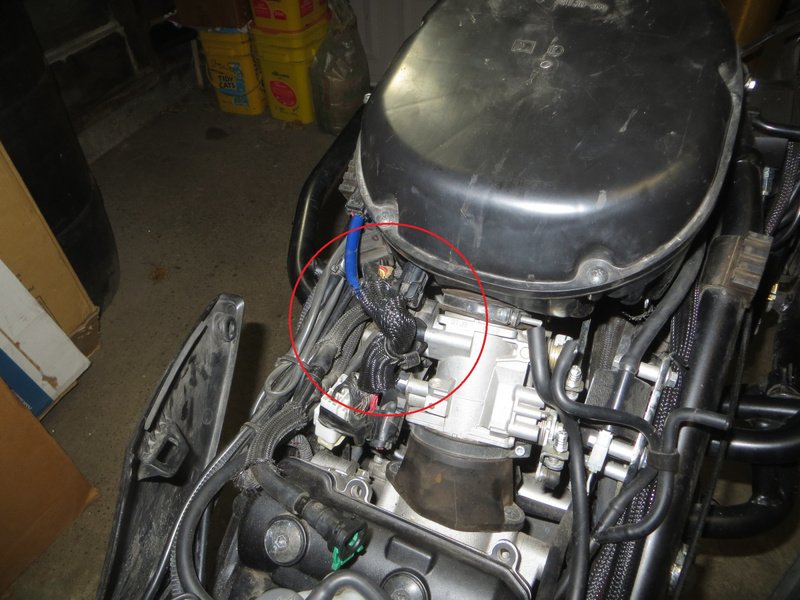 On my Vee2 it was the wires as they exited the secondary throttle position connector that were at risk of rubbing on the tank. If the signal wires are fully or partially shorted to ground (or to each other) the ECM will get no signal or a false signal and cry about it. I would start with a physical inspection of the wires on that connector. Do you have a service manual? Having trouble with site attaching photo... I will attempt to edit the photo into the post. Last edited by Grimmer; 03-17-2019 at 02:49 AM. It is giving me a "page can't be displayed" error when I try to manage attachments. Was the wiring loom in question, replaced for the associated recall? Hi, ECU swapped, yes. The battery is original. It hasen't given any sign of trouble, the volt meter reads 14.1 but I have not had it tested for crank amps. Thanks. Those suspect wires were checked but deemed okay and just got some padding. But I got that all done very early on in the episode, so I'll check them again. Grimmer, No I don't have a service manual. (both your photos did publish) But I understand what you are saying. I read somewhere that with the airbox exposed you can see the butterflies open and close when you turn on the key as a part of the pre-test. Do you know if that is true? Also I will definitely check all the physical connections and wiring. I'm still puzzled that it takes a few miles for it to fail. I guess that could be exposed wires heating up from partial contact, huh.